The OTC’s 2018 Annual Conference is taking place May 6-8 at the Four Points by Sheraton in Kingston, ON. Join your colleagues from across the province to share ideas, see the latest in technology and to hear from industry experts on topics including Prioritizing Capital Projects, Site Selection & Automated Speed Enforcement, Building a Suburban/Small Town Multimodal Network and many more. This year’s program is filled with seminars, technical tours and social events you won’t want to miss. 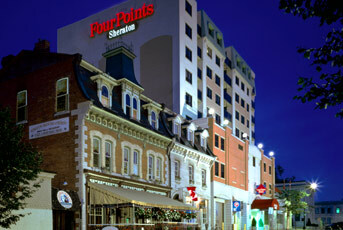 A room block has been established for Conference attendees with a rate of $135/night. To book your accommodations, please contact the hotel directly by phoning 866-716-8133 (state that you are with the OTC group) or book through the following link: OTC Four Points Room Booking. **Rooms must be booked by April 27 to ensure this rate. The OTC has partnered with VIA Rail to offer delegates a 10% discount for tickets purchased for travel to/from Kingston between the dates of May 4th-May10th. To obtain the required code, please contact the OTC office at traffic@otc.org. **Participants who cancel their registration prior to two weeks before the scheduled course date are eligible for a full refund. Substitutions will be accepted up to one day prior to the event.